This is literally a walker’s paradise, with mountains, forests, and incredible beaches at every turn. To put it simply, the diversity of walking here is astonishing. A visit to the remote and mostly uninhabited Flinders Island is like stepping back in time. The pace of life here is slower, the locals friendlier, and the air, perhaps the cleanest in the world. The walking here is so impressive and so breathtakingly gorgeous it’s a wonder that this place remains so unknown. Imagine the Bay of Fires meets Wilsons Promontory on steroids, and it’s no wonder this was all part of the same mountain range when Tasmania was still joined to the mainland. Mt Strzelecki is the tallest mountain in this mountain range and definitely the most striking. Wildlife abounds with wallabies, Cape Barren geese, wild peacocks, pheasants, various birds of prey and large numbers of seabirds all calling this place home. At the end of each day you’ll have the luxury of having a hot shower, a chef-prepared two course dinner and a good night’s sleep in a comfortable bed. Awake refreshed and primed for each day’s fabulous pack free walking starting with a chef-prepared breakfast. One evening we will cruise over to the Short Tailed Shearwater birds feeding grounds, which are three small island off Flinders Island, and watch the clouds of birds swoop in to feed their young. With two outstanding guides looking after you, you can pace yourself because we can offer a choice of easier or harder walking options along the way. This afternoon we will endeavour to do a short forest walk at the foot of the Strzelecki Ranges or at Marshall Beach to Castle Rock (subject to flight arrival times). Head north on the west side of the island to Mt Killiecrankie. Today’s stunning coastal hike hugs the rocky shores from The Dock to the sleepy fishing settlement of Killiecrankie. Orange lichen decorates the granite boulders and the azure blue water beckons swimmers at Stacky’s Bight. Old Man’s Head, a unique rock formation, dominates the southern section of the hike. We will also do a short walk at North East river. The highlight for many will be the challenging ascent of Mt Strzelecki, named after Sir Paul Edmund de Strzelecki who explored many parts of Australia in the 1800s. He’s well known for being the first European to climb Mt Kosciuszko – Australia’s highest mountain. The track climbs up through the rugged Fotheringate Creek valley where there are waterfalls and a delightful fern gully. As you climb higher the vegetation changes to sub alpine and finally you reach the bouldery summit. At 756 metres, you are on the highest point on the island. If there is time or if the conditions dictate, we will set off to the Darling Ranges in the central part of the island. Starting at aptly named Walkers Lookout, we traverse a high ridge that offers excellent views in all directions. For fit walkers with a good head for heights there’s an optional ascent of atmospheric Mt Pillinger – known to locals as the Gin Bottle. We will also enjoy a sunset cruise to the feeding grounds of the Short Tailed Shearwater birds, watching them fly in at dusk to feed their young. This holiday finishes today with a small walk at Trousers Point before being transferred to the airport. The tracks are diverse, but with our guides, are relatively easy to negotiate. Full day walks average about 14km. There are opportunities for fit walkers to challenge themselves on two of the days on more difficult walks and optional additional walking. For three nights, we stay at Mountain Seas Lodge with amazing views over the Strzelecki Ranges and the ocean. The property operates as an organic farm with large portions being native bush. Walks are available from the property in addition to what we are providing. All of the rooms have ensuites. The property has individually themed rooms, a licensed restaurant, lounge, bar and decks with wonderful views. Expect to be looked after in style. As the property is organically certified, we get to enjoy some of the fresh produce from the farm. Breakfasts are continental and cooked in preparation for the upcoming days walk. Each day you’ll be provided with a substantial walkers lunch, more importantly you’ll get to eat it at fabulous locations on the island. A walkers lunch may include a high protein type salad, a roll or a wrap, a muesli bar, cake or muffin and a piece of fruit. Each day is slightly different. Lunch is always augmented by Auswalk’s famous trail mix. Each night we enjoy a fabulous 2 course dinner at the lodge. The island is 75km long and 40km wide. It sits in the middle of Bass Strait and is accessible by plane from either Melbourne or Launceston in Tasmania. We will meet you at the airport on the island on the first day and return you on the last day in plenty of time to catch your flight. We have graded the walking on this trip as easy to moderate. The walking on the first and last days is relatively easy. The second and third day walks are moderate and moderate to challenging. The tracks vary in quality but all are easily navigable. There are well formed tracks and sections where your local guides will have you pick your way along rocky shorelines and sandy beaches. There are some opportunities for fit walkers to challenge themselves but the main walks are all easy to moderate, with the only exception being Mt Strzelecki. This trip operates with two knowledgeable, engaging guides so we can offer easier and harder walk options along the way. This trip operates with two knowledgeable guides so we can offer easier and harder walk options along the way. 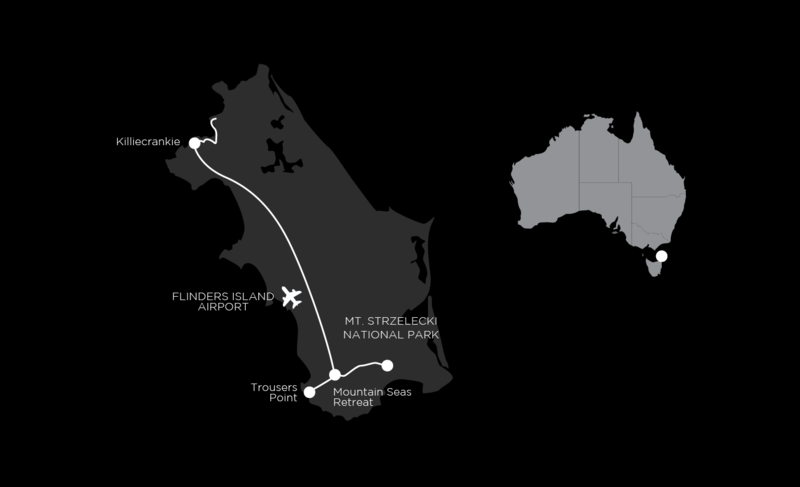 The walk starts and finishes at the Flinders Island airport, transfers to and from your accommodation are included. Flinders Island has a temperate coastal climate that is suitable for walking at every time of the year except the winter months. Summer weather is mild compared with most of Australia, and winters never have frost. No wonder locals wouldn’t live anywhere else.